A Time and A Place features photographs by Elizabeth Greenberg and mixed media work by Howard Greenberg. In her ethereal black and white photographs, Elizabeth uses landscape imagery including open spaces, fleeting, tranquil moments, and broken rays of light, as not a documentation of place but rather a vehicle to transport the viewer and induce particular states of mind. Howard will exhibit a new body of work that replicates elements of paintings by Kazimir Malevich, Russian artist known for founding the Suprematist movement about 100 years ago, a movement that championed abstraction and pure artistic feeling over representation. 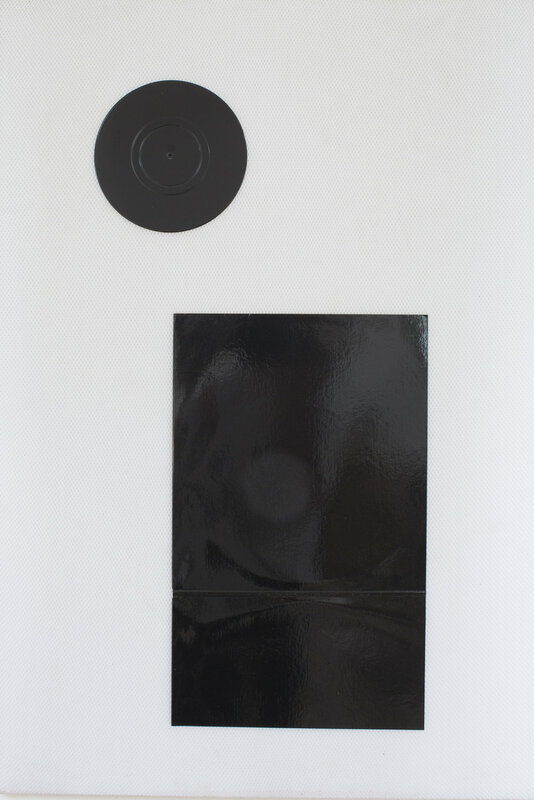 As with Malevich’s work, the pieces are primarily black and white geometric abstractions but in reinterpreting these pieces Howard incorporates found material including records, record covers, speaker grill cloth and carpet padding. Though working in different mediums and employing diverse visual language, Elizabeth and Howard both seek to address themes of physical versus perceived reality through these bodies of work. This will be the first time the couple, both artists and educators in Midcoast Maine, have exhibited their work together. Elizabeth Greenberg is an artist and educator living in midcoast Maine. She received her BFA in Photography from Rhode Island School of Design and her MFA from Vermont College. Following undergraduate school, Elizabeth spent a summer at The Maine Photographic Workshops (now Maine Media Workshops), thus beginning a long-term relationship with a place she still calls home. Currently Elizabeth is the Vice President of Academic Affairs at Maine Media as well as a member of the faculty in both the certificate and Master of Fine Arts programs at the College. Elizabeth has taught at numerous schools and has exhibited her art nationally and curated several traveling exhibitions. For several years she worked as assistant and studio manager for photographer Arnold Newman and went on to assist several other well-known photographers in New York. She works with the Arnold and Augusta Newman Foundation to promote the Arnold Newman Prize for "New Directions in Photographic Portraiture." Howard Greenberg is an artist based in Rockport, Maine and is the chair of the MFA program at Maine Media College. He received his MFA from Vermont College. He has taught painting, drawing, printmaking, and 2-dimensional design at Rockport College (now Maine Media College), Rockport, Maine; Lafayette College in Easton, Pennsylvania; The University of Maine, Augusta; and at the Baum School of Art in Allentown, Pennsylvania. Mr. Greenberg has been represented by Schmidt/Dean Gallery in Philadelphia since 1990. His work has been exhibited in solo and group shows since 1987 at such venues as: the Portland Museum of Art; The North American Cultural Center, San Pedro, Costa Rica; The University of Maine at Augusta, and many, many more galleries across the United States.